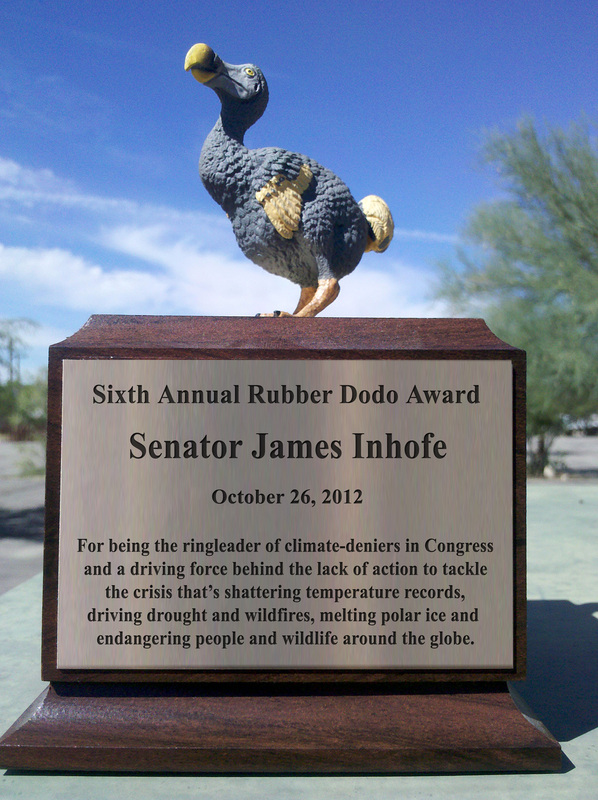 TUCSON, Ariz.— Senator James Inhofe, one of Congress’ staunchest deniers of climate change and stalwart human obstacle to federal action on this unprecedented global crisis, is the lucky recipient of the Center for Biological Diversity’s 2012 Rubber Dodo Award, which is given annually to those who have done the most to drive endangered species extinct. Previous winners include the U.S. Chamber of Commerce (2011), former BP CEO Tony Hayward (2010), massive land speculator Michael Winer (2009), Alaska Gov. Sarah Palin (2008) and Interior Secretary Dirk Kempthorne (2007). When it comes to denying the climate crisis — the single-greatest threat now facing life on Earth — James Inhofe has few peers. The Oklahoma Republican is the ringleader of anti-science climate-deniers in Congress and a driving force behind the tragic lack of U.S. action to tackle this complex problem. 2012 saw the publication, to resoundingly little critical acclaim, of Sen. Inhofe’s book, The Greatest Hoax: How the Global Warming Conspiracy Threatens Your Future, by WND Press, an entity also known for its “birther” campaign against President Barack Obama. This year is on track to become the warmest on record; some 40,000 temperature records have been broken in the United States in 2012 alone, while Arctic sea ice has melted to a record low. The year has also seen record droughts, crop failures, massive wildfires, floods and other unmistakable signals that manmade global warming is tightening its grip, threatening people and wildlife around the globe. 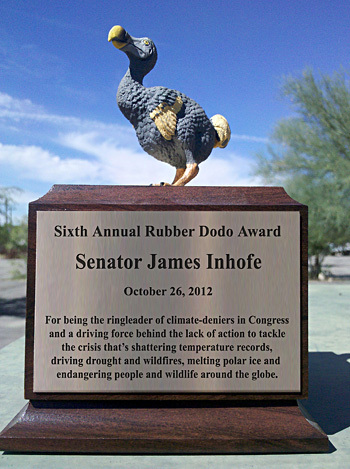 More than 15,000 people cast their votes in this year’s Rubber Dodo contest. Other official nominees were Sen. Jon Tester of Montana, who put a rider on a must-pass bill that stripped Endangered Species Act protection from wolves, and Shell Oil, a company bound and determined to pursue dangerous oil drilling in the Arctic Ocean. In 1598, Dutch sailors landing on the Indian Ocean island of Mauritius discovered a flightless, three-foot-tall, extraordinarily friendly bird. Its original scientific name was Didus ineptus. (Contemporary scientists use the less defamatory Raphus cucullatus.) To the rest of the world, it’s the dodo — the most famous extinct species on Earth. It evolved over millions of years with no natural predators and eventually lost the ability to fly, becoming a land-based consumer of fruits, nuts and berries. Having never known predators, it showed no fear of humans or the menagerie of animals accompanying them to Mauritius. Its trusting nature led to its rapid extinction. By 1681 the dodo was extinct, having been hunted and outcompeted by humans, dogs, cats, rats, macaques and pigs. Humans logged its forest cover while pigs uprooted and ate much of the understory vegetation. The origin of the name dodo is unclear. It likely came from the Dutch word dodoor, meaning “sluggard,” the Portuguese word doudo, meaning “fool” or “crazy,” or the Dutch word dodaars meaning “plump-arse” (that nation’s name for the little grebe). The dodo’s reputation as a foolish, ungainly bird derives in part from its friendly naiveté and the very plump captives that were taken on tour across Europe. The animal’s reputation was cemented with the 1865 publication of Lewis Carroll’s Alice's Adventures in Wonderland. Based on skeleton reconstructions and the discovery of early drawings, scientists now believe that the dodo was a much sleeker animal than commonly portrayed. The rotund European exhibitions were accidentally produced by overfeeding captive birds.